OH MY GAWD I WANT A MOTORBIKE! Ever since I was a teenager, I’ve wanted one, then I went to Wheeldon and rode motocross this summer and upped the lust a little and last week’s outing to Nitro Circus has done little to diminish the craving. Pre-practice, I squeezed in a backstage chat with with Lyn-z Adams Hawkins and Jolene Van Vugt, which I posted this week on the Red Bull site, then I headed to the arena for some close up motocross action, whip after whip flying in endless trains. 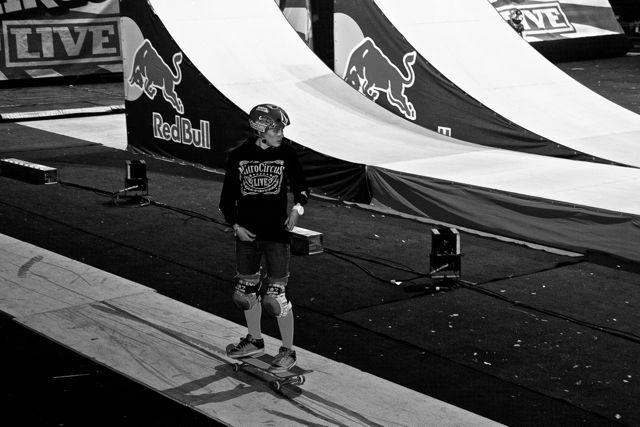 Lyn-z was working on her 360’s over the 50 foot gap of the mega ramp, and Jolene didn’t show, probably wanting to save her ravaged body for the show that evening.